Trailing 41-38 with eight seconds remaining in the third quarter, Stony Brook Women’s Basketball senior guard Shania “Shorty” Johnson looked to uniquely create an open shot away from the basket against Binghamton. As time continued ticking away, Johnson found her sweet spot around half court and released a high arcing blast. The ball swished through the net, leaving the Bearcats defense and the crowd at the Island Federal Credit Union Arena stunned as the senior danced her way to her ecstatic teammates. 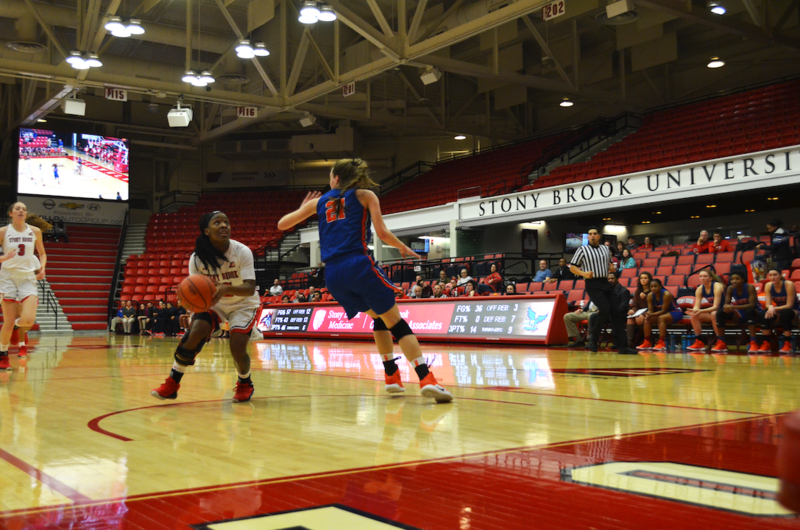 The basket stimulated new life into Stony Brook’s offense as it deftly toppled Binghamton 27-12 in the fourth, earning the 68-53 victory on Wednesday, Feb. 6. Johnson spearheaded the Seawolves’ scoring through the first three quarters of the game, but her dynamic passing wound up being the difference maker needed for earning the victory. The guard dished out five assists that contributed to the unanswered 14 point run, midway through the fourth. The senior led the game with 23 points, nine assists and six steals and knocked down all eight of her free throw attempts. Johnson’s no-look behind the back pass to senior guard Jerell Matthews connected for a wide open three and iced the game for Stony Brook. It was one of several outstanding plays from the victory and was featured on SportsCenter’s Top 10 plays of the night. Matthews was nearly automatic from three and knocked down six shots in eight attempts. The senior showcased her best shooting performance of the season, finishing with 20 points by connecting on 78 percent of her shots. Binghamton focused on scoring from three opening the contest, with three of its five makes coming from long range in the first. Junior guard Kai Moon converted a 3-pointer and handed the Bearcats the 13-7 lead with three minutes left in the quarter. Defensively, Stony Brook shut down their rival for the rest of the quarter as sophomore guard Jonae Cox cut the deficit to two points with a three. As Stony Brook adjusted to limiting Binghamton’s impact from three, the Bearcats turned to their forwards inside for substantial buckets. Senior forward Rebecca Carmody split through the holes in the Seawolves defense while sophomore forward Kaylee Wasco dominated the paint, keeping the Bearcats up 30-27 through the first half. Stony Brook displayed another impressive rebounding showcase, a category the team leads the America East in with 888 overall. The Seawolves prohibited the Bearcats from earning a single offensive rebound in the first half and finished with 41. Sophomore forward India Pagan guided the team by grabbing a career-high 11 rebounds, setting up potential scoring opportunities. Stony Brook gained sole possession of fourth place in the America East standings and are only half a game behind Albany, entering the second half of the season. The Seawolves will look to move up when they face the UMass Lowell River Hawks on Saturday, Feb. 9 at 1 p.m.